In spite of the challenges faced by the province last year, the economy of Bohol in 2017 showed positive and strong performance as seen and observed by the growth and continued increase of its key economic drivers. Robust growth was observed in the agriculture sector, tourism, sea and air transport, and retail trade. The province of Bohol contributed enormously to the economy of the region next to Cebu, posting an impressive average economic growth of 9.1%2 higher than the national economic growth of 6.7%. While Central Visayas in 2017 showed a slower growth at 5.1%3, lower than the national growth last year, but still the region remains the country’s fourth largest economy. Agriculture. For agriculture, 2017 was a better year in Bohol except for fishery, with crops and livestock performing well compared to the previous year. The sector posted the fastest growth, a big turnaround from 2016’s downbeat production. The assistance to El Niño-affected farmers by the Provincial Government of Bohol (PGBh) helped hasten the recovery of the sector from the low harvest experienced in 2015 and 2016. The crops subsector was a top performer in 2017, with rice production up by 48%. The province of Bohol has the highest percentage increase in palay production in the entire Philippines and is a consistent major supplier of rice in Central Visayas, contributing 73% of the entire region’s rice production. In the case of livestock, all subsectors realized an increased in output with a 2% increase in inventory. However, the fishery sector continues its poor performance and its production had been on a downtrend, registering a double-digit decline at negative 28%4. IT/BPM. In terms of Information Technology/Business Process Management (IT/BPM), investments in Bohol are still limited with most of the IT players in Bohol are small-scale freelance workers in the industry. However, the province is set to host IT/BPM companies with the completion of fiber optic links and the construction of 2 new BPO-ready buildings to host BPO investments. Bohol has a potential to grow its outsourcing sector. A growing number of BPO companies are looking at Bohol as a potential expansion site. Prices. Average inflation rate in 2017 for Bohol was higher at 3.4% compared to only 2.2% in 2016, a bit higher than the regional and national average of 3.2%.9 Of the 11 commodity groups, only 2 registered a high annual average inflation in 2007, these were food/non-alcoholic beverages, and housing, water, electricity, gas fuels. Bohol saw prices increasing sharply for fish and fruits posting double digit inflation rates at 14.8% and 11.4%, respectively. Mainly due to the limited supply of fishery products and increased demand for fruits and health-conscious consumers helped push prices up. Housing, water, and electricity also registered double digit inflation rates as a result of the series of oil price hikes as demand for oil in the international market outpaced global supply. These led to upward adjustments in electricity and water rates. 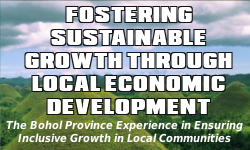 A positive growth is foreseen in the province of Bohol as its growth drivers are in a growth momentum. As ongoing activities in tourism, real estate, ICT sectors and agriculture could further boost the economy of the province in 2018 and beyond. Tourism will continue to soar as the New Bohol Panglao Airport is nearing completion and is soon scheduled to be operational. Allied industries are more likely to resonate to the accommodation facilities a hotel operators are looking forward to a year-round occupancy as tourist arrivals are expected to grow by 15 to 20% during the year.10 Likewise, the transport industry is seen to benefit from the projected increase in tourism-related activities, as airline companies are expected to launch additional flights with the opening of the new airport and the shipping companies could see a boost with the expected increase in arrivals. Agriculture performance will be mainly dependent to good weather, as major weather disturbances will affect production. Fisheries will continue to perform below par as it continues to grapple with the problems and issues faced by the subsector in 2017. Inflation is expected to accelerate in 2018 due to the implementation of new taxes and increase in prices of oil products. Inflation in Central Visayas is supply-side driven, as food and non-alcoholic beverages is contributing 3.6% to year-on-year inflation.11 The DTI and DA are to set standard retail price for basic agriculural goods and expand monitoring of prices to curb inflation. The PGBh will intensify the household level agriculture programs and projects to help sustain its production and ease the inflation effects. Inflation Rates by Commodity Group (2017). 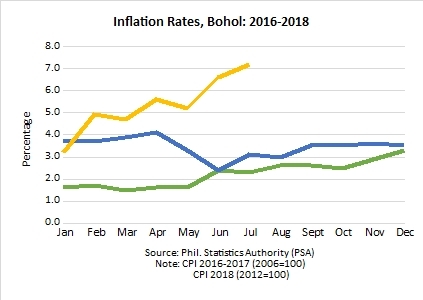 In Bohol, among the major items in the CPI basket, the Food and Non-alcoholic Beverage Group posted high inflation rate (4.3%) due to sustained increases in the prices of fish and fruits, which registered double-digit inflation of 14.8% and 11.4%, respectively. This is followed by meat (3.7%), rice (3.2%) and vegetables (1.8%).14 These increases are caused by the limited supply of fishery products and increased consumption for fruits due to demands from existing and newly opened resorts and catering/food catering businesses. Other factors that drove prices up were poor harvests and high cost of production, as cited by industry players. The next commodity group that contributed to the high inflation rate is Housing, Water, Electricity, Gas and Other Fuels (4.7%). Inflation in this group was directly affected by the higher prices of fuel products and the newly-imposed excise tax on oil products that led to upward adjustments in water, electric rates and other services. The water supply registered the highest increase at 11.2% followed by electricity, gas and other fuels at 7.9%. Inflation in the alcoholic beverages/tobacco group was mostly driven by the imposition of higher excise tax on cigarettes and other tobacco products. Inflation Drivers. Inflation is affected by external factors and usually supply-side driven. Such inflationary pressures include (1) international economic and geopolitical tension; (2) higher world oil price that reached US$73.40/barrel from $40-50/barrel; and (3) weather disturbances that destroyed some major crops and other food sources. Inflation Mitigation Measures. The government provided mitigating programs to help minimize the social effects of inflation in the household income, fuel prices and food prices through the following measures: Unconditional cash transfers for the poorest households; subsidy for jeepney drivers (Pantawid Pasada) and the 1-peso fuel discounts for Public Utility Vehicles (PUV) by private oil companies; rice tarrification; and continued price monitoring by the Department of Trade and Industry (DTI) and Department of Agriculture (DA). Outlook. Based on the Bangko Sentral ng Pilipinas (BSP) report, inflation is expected to settle above the end of the target range for 2018, particularly due to the uptick in the purchasing and consumption activities during the Christmas season. However, they are optimistic that this will revert back to within the target rage (2-4%) in 2019-2020. In as much as the current price pressure is mainly supply-side driven, particularly in the Food group, addressing local supply constraints to curb inflation must be given priority by the Provincial Government of Bohol (PGBh), other LGUs, government and non-government agencies pursuant to Gov. Edgar M. Chatto’s policy directive. This is especially true in improving agriculture productivity. The PGBh must intensify activities for major programs in Crops Productivity for rice, corn, and other high-value commercial crops. Another is the intensification of the participation at the household level of agricultural programs like the BAHAY KUBO FAITH, HOPE and CHARITY projects, together with the Gulayan sa Paaralan for household sustainability. A regular supply of NFA rice especially in rice deficient areas must be given priority. The continued and sustained supply of fish through a consistent Bohol Fish Market operation is also necessary to help maintain fish prices to help ensure the supply of affordable fish to the Boholanos. The regular price monitoring and reporting by the DA and DTI and the vigilant attention of the local Price Monitoring Council can further ensure the management of prices of basic and prime commodities.